2015-16 Leaf Metal Hockey Proof takes the authentic pre-production cards from the main Metal Hockey set to make a very limited release with only one-of-one cards. Boxes include three random proofs. Featuring the full-color proofs from 2015-16 Leaf Metal Hockey, each of the cards have been slabbed by Beckett and labeled as 1/1 on the case. Although the original set only features autographs, these proofs will not include the sticker signatures. 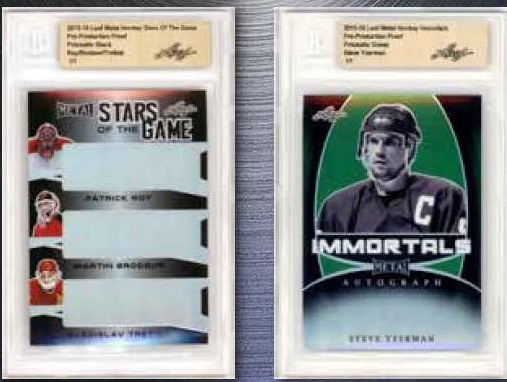 As noted on the initial sell sheet, the checklist offers "each and every card included in this year's Metal Hockey." Based on the mock-up images, that also means the various parallels. Leading the way, hyped young star Jack Eichel is part of the release. 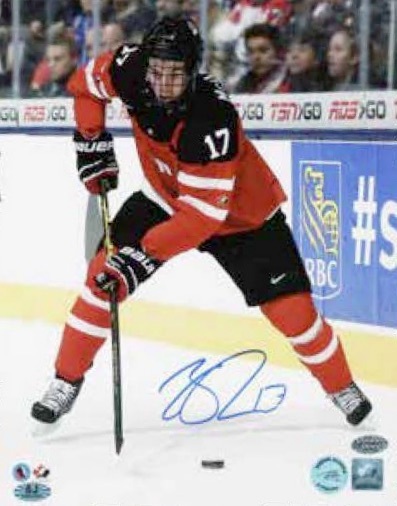 As an added incentive for case breakers, a signed 8x10 for Connor McDavid acts as a topper in each case. Given the logistics of a set that only has one-of-one cards, it is understandable that 2015-16 Leaf Metal Hockey Proof is quite limited. The total run is 56 cases that each contain 20 boxes. The product was issued with an immediate sales window on a first come, first served basis. These are mock-up images and subject to to change.